First published in Rip It Up, August 1986. 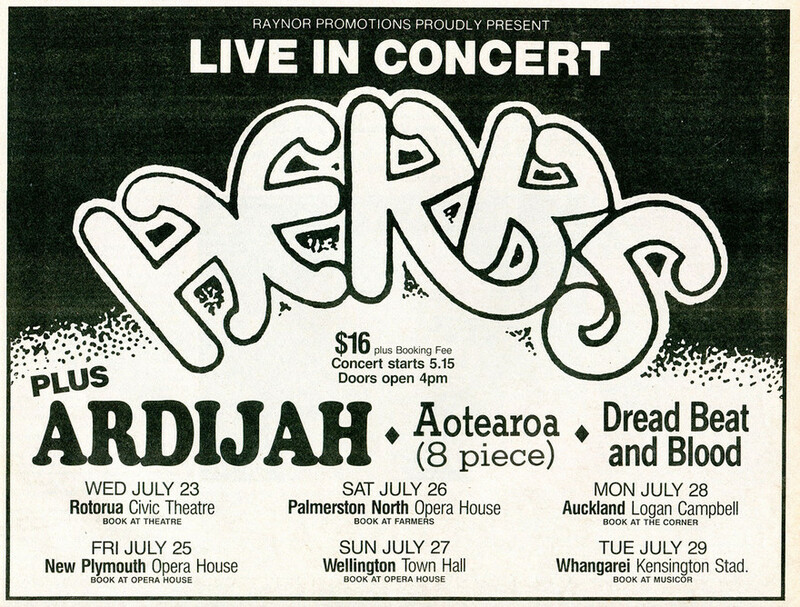 It was Māori Language Week when Ardijah, Aotearoa, Dread Beat & Blood, and Herbs played the last night of their nationwide package tour in Whangarei, on 29 July 1986. I drove up from Auckland thinking such a landmark tour should be covered. I came away feeling that if there is any mainstream “movement” in New Zealand music that is alive and developing, it is the Māori and Polynesian music of which these four bands, with the Pātea Maori Club, represent the leaders. It was a disappointment, there­fore, to find upon entering the Ken­sington basketball hall only 400 people inside. (Still, it’s a better per­centage than in Auckland, where only 700 ventured out to the Logan Campbell Centre). At the door, the amiable security guards checked for forgeries (there was no visible police presence – and no trouble). After a long a capella introduction from several members of the band, the smooth, slick sound of Aotearoa emerged. First up at 6.30 sharp was Aotearoa, an eight-piece band from the capital, and unashamedly polit­ical. “We’re a band with a message,” said their leader Ngahiwi Apanui as soon as they were on stage. After a long a capella introduction from several members of the band, the smooth, slick sound of Aotearoa emerged: wonderful harmonies, lyrical sax and guitar playing, and a superb, effortless rhythm section. The mood of Aotearoa was more like a rally than a lecture, however: the last song was “all about be­ing positive,” and the refrain said ex­actly that: “Think positive!” After the example of Aotearoa, it would be im­possible not to. With Dread Beat & Blood, it’s the Jamaican influence rather than the political message that takes the forefront. They have the look and sound of a roots reggae band, and are as technically proficient at their music as Aotearoa are at theirs: mu­sicianship is a point of pride for these bands. Another large group, Dread Beat & Blood has a daunting frontline of four unsmiling, dreadlocked rastas, all in Ray-Ban sunglasses and jun­gle fatigues. Their first number cruises along in the trance-like manner of Big Youth: slow, sluggish reggae, as thick as Visco-static oil. The mixer really knows how to get that big, reverberating dub sound to the bass, which helps. There are cheers and whistles from the audience as they recog­nise the poppier sound of ‘No Wom­an, No Cry’ – once again superb har­monies decorate a beautiful melo­dy. An original follows, still with the spare keyboard work, slinky guitar, and high tenor voices characteris­tic of pure reggae. After a long, mellow, farewell number, it is “Thank you Whangarei”. Dread Beat & Blood are a tes­timony to the excellence that can be achieved – without losing an in­dividual character – by coming up through the traditional route of play­ing covers, before trying out one’s own work on an audience. This point is hammered home when Ardijah takes the stage. “If you’re looking for a class act, this is it,” says Apanui in his introduction. Af­ter an apprenticeship of many years in the clubs of south Auckland, Ardijah has arrived. With their slick production and stylish presentation – plus a single in the Top 20 – they certainly have the air of a “class act” from the big city. The crowd moves up to the stage to have a closer look. Complete professionals, Ardijah leaves the audience still dancing, and with a message to remember. All four members are dressed in deep red jackets, white shirts and black ties, making the other bands look dowdy. Like all the bands however, they have their own distinctive sound. Ardijah’s is the sophisticated sound of club funk, provided by the silky voice of Betty-Anne Monga, the delicate tenor of guitarist Tony Nogotautama, Ryan Monga’s plucked Steinberger bass, the upbeat synths of Simon Lynch (the only Pākehā musician on the tour), plus a drum machine and sundry percussion. Immediately their groove goes right through you with their own song, ‘Joystick’; Betty-Anne adding rhyth­mic colour (congas, chimes, cym­bals) and singing great backing vocals, as electronic wizardry is provid­ed by the synthesiser’s joystick. Then, with ease and grace, she sings ‘Somebody Else’s Guy’, a torch ballad accompanied by Lynch on piano. Tony provides the on-stage repar­tee: “This is a song by a group that has been a great influence on us: Rick Dees and his cast of millions ...” No, no, he’s just jiving. It’s ‘Time’ by Mtume, with warm synthesisers, à la Bobby Womack. Ardijah has a seamless, tireless groove, and that’s the only problem with the band – drum machines never let up, and after laying down some moves for a few songs, you’re worn out, it’s like dancing to a metronome. ‘Time Makes the Wine (Get Stronger)’ follows. It’s a great radio tune, if they played indigineous music in Whan­garei (though the concert was sponsored by the local private FM station). The song is also Tony’s guitar showpiece. There are many links be­tween heavy metal and funk, and it’s usually in the guitar solos. With plenty of echo, this was pure Jimi Hendrix: Tony just stopped him­self from playing with his teeth. “D’you wanna party?” During Ardijah’s sign-off song, they in­troduce the band, and their philosophy. To the nightclubber’s manifesto – “Dancing, and singing / that’s all I ever really want to do” – each band member has a moment in the spotlight. Ryan’s solo, with his back to the audience, is tastefully short. On ‘Jah’s Son’ (“is coming your way”) keyboardist Tama Lundon, singing to his hometown, is assisted by five others, making six glorious voices at once, with new bass player Charlie Tumahai tossing his head about like a funky rag-doll, radiating happi­ness as he sings. ‘Long Ago’ is brooding and moving with a karanga opening, and ‘Reggae’s Do­ing Fine’ is a vocal showpiece, Tumahai showing more cross-pollination as he worries a line, Otis-style, perfecting the pitch with his finger in his ear. 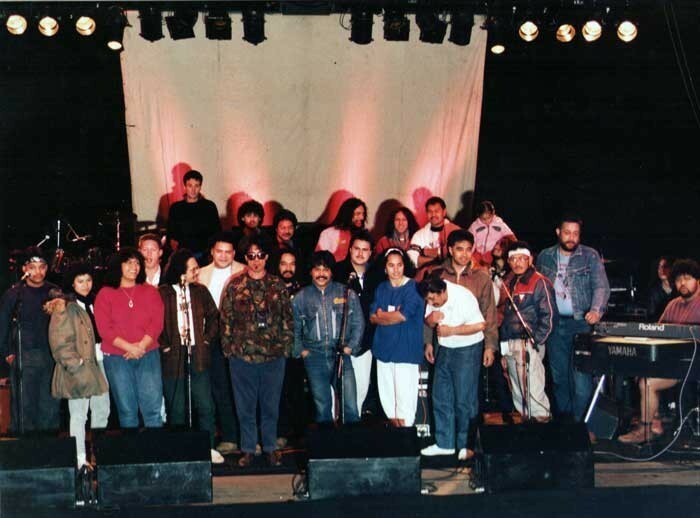 The whole cast was on stage by now, 30 people crowding for a microphone, with Herbs’ lead singer Willie Hona encouraging a young relative to sing with him and breakdance. “We’d like to end with a tribute to Prince Tui Teka,” said Hona. The song was ‘Hine E Hine’, a Māori ballad which, with ‘Pōkarekare Ana’ and ‘Pō Atarau’ / ‘Now is the Hour’, is familiar to all New Zealanders. It was a moving gesture to a loved and respected Māori entertainer from New Zealand’s most loved and respect­ed band, and a powerful finale to a remarkable tour.